Jim Willett has never smoked pot. His teenage sons think he’s a square. A former Navy pilot, Willett spent a year flying drug interdiction patrols along the Washington coast, checking for ships carrying bales of marijuana. For the graying retiree, voting against the state’s legalization of recreational weed last fall was pretty much a given. Welcome to the weed stampede. If all goes according to plan, the Washington State Liquor Control Board will begin accepting applications from pot retailers, growers and processors this month and grant licenses in December to qualifying companies. Recreational stores could start cropping up early in 2014. These entrepreneurs aren’t just blowing smoke. The potential profits could be sky high. Trade publication Medical Marijuana Business Daily foresees national revenues from legal weed rising to between $1.3 billion and $1.5 billion this year. (For those who haven’t been keeping score, medical marijuana is now legal in 18 states and Washington, D.C.) Add in the recreational pot shops opening in Washington and Colorado next year and those figures could jump to between $2.5 billion and $3 billion, the publication reports. How much cash the 25 percent excise tax on licensed sellers, cultivators and makers of pot tinctures, balms, edibles and beverages will yield remains to be seen. The Liquor Control Board estimates it will collect “anywhere between $0 and $2 billion” in tax revenue during the first five years of legalization. The generous spread accounts for the fact that no one can predict whether the federal government, which still forbids possessing, growing and selling pot, will shut down the adult-use party. “This is the greatest business opportunity since the falling of the Berlin Wall and the opening up of the free market in Europe,” says Steve DeAngelo, longtime marijuana activist and president of The ArcView Group, which drew “cannabusinesses” from around the country to two pitch slams in Seattle this year. DeAngelo runs Harborside Health Center in Oakland, California, considered the world’s largest medical marijuana dispensary and featured on the Discovery Channel show Weed Wars. Harborside recently made headlines when the City of Oakland sued the federal government for trying to shut down the dispensary. Capital Idea. Brendan Kennedy is CEO of Privateer Holdings, said to be the marijuana industry’s first private equity fund. Cale Burkhart shares the sentiment. A longtime fan of “the naturopathic and herbal thing,” the 35-year-old started using cannabis extracts in 2009 to alleviate migraines, insomnia, and neck and back pain. The following year, he developed Vita Verde, a collection of pot-infused topical creams now sold at 45 dispensaries around the Puget Sound region. He has since added tinctures and edibles to his product line and will apply for Washington producer and processor licenses this month. His plan is to grow artisan, organic marijuana strains for making his infused products, which he hopes to sell in Seattle’s recreational pot shops. Growers, sellers, processors and testing labs aren’t the only ones gathering at Washington’s adult-use starting line. A passel of attorneys, accountants, publicists, insurance agents, business consultants, software developers, security companies and makers of vaporizers, oil extraction equipment and pot vending machines—many of them based in Colorado, California and other marijuana-friendly states— stand ready to support the budding recreational market. By not handling pot directly, these ancillary businesses skirt Washington’s three-month residency rule and Liquor Control Board licensing requirement. Being a step removed from the plant also reduces the risk of being shut down or, worse, imprisoned by the federal government. Grass Roots. 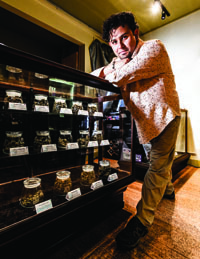 Oscar Velasco-Schmitz, who runs the Dockside Co-op medical marijuana dispensary in Fremont, is waiting for more clarity from the state before he considers joining the recreational marijuana fray. marijuana facilities in a half-dozen states. Medical pot growers and sellers need reliable security, as many are cash-based operations. Washington’s new recreational marijuana rules—which include strict security requirements for state-licensed growers, processors and retailers—are a boon for Canna Security. Wearing a fleece jacket adorned with an innocuous, leaf-free company logo, Williams says he anticipates onethird of his sales originating here in the coming two years. “Right now, we’re just dumping money into setup, employees and training,” he says of the rapidly growing company’s expansion into Washington. He is also looking into downtown Seattle office space as well as on Queen Anne and Phinney Ridge, and pricing billboards, which the Liquor Control Board allows provided rules about location, message and not targeting minors are met. None of this means the region is heading for a reefer free-for-all. Despite the changing legal tide, the barriers to entering the legal pot market remain steep. Applying for a recreational retailer license is one hoop Velasco-Schmitz, a former software engineer and restaurant owner, is in no rush to jump through. (I-502 does not apply to medical marijuana operations, which remain loosely regulated and taxed by the state—a discrepancy the Legislature is working to resolve.) For now, he’s content waiting to see what solution the state comes up with. “If push comes to shove and we have to jump into the I-502 regulatory scene, then we’ll do whatever we have to do for our patients to have access,” he says. For growers, processors and retailers ready to take the recreational plunge, startup costs can be significant, given the state’s security, insurance, testing, labeling and inventory-tracking rules. Would-be potpreneurs without personal savings, an ample credit line or well-heeled friends and family quickly learn that finding funding is a crapshoot. Bank loans are not an option. Most banks won’t even give pot shops a checking account or credit card since federal regulations require them to report customers suspected of breaking federal law. Investors willing to gamble on companies that directly touch the plant are needles in haystacks, too. Location also can be tricky. Per I-502, cannabusinesses can’t be within 1,000 feet of a school, library, playground, park, rec center, day care center, public transit center or an arcade open to minors. Factor in municipal zoning restrictions and the options diminish further. The Seattle City Council, for example, plans to restrict new retailers from operating in residential areas and historic districts. For Burkhart, finding a compliant location entails checking Google maps for neighboring schools and day care centers, walking the neighborhood and, if necessary, hiring a surveyor. Local landlords have their own concerns. Many of the landlords whom Seattle real estate attorney Brian Danzig counsels worry about the security, insurance and legal implications of leasing to a tenant in the cannabis business. 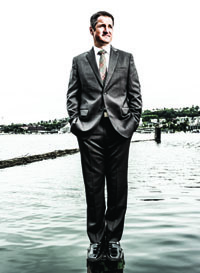 “I’ve had an equal amount of clients who’ve contacted me about not having cannabis [in their building] as clients who’ve contacted me to say they wouldn’t mind having cannabis,” says Danzig, a partner at Gordon Thomas Honeywell and chair of that law firm’s Seattle Real Estate Group. The list of obstacles goes on: Dispensaries and retailers aren’t eligible for the same federal tax deductions as most American companies because the federal government considers them drug traffickers. Without a bank account or credit card, they’re stuck running a cash-based business. Those that do land a banker—often by presenting themselves as “wellness providers” instead of pot purveyors—run the risk of getting their personal and professional accounts closed once the bank catches on. Above all, receiving a shutdown letter from the Drug Enforcement Administration (DEA) is not outside the realm of possibility. • Keeping adult-use marijuana out of the hands of minors. Washington’s potpreneurs say they’re up to the challenge. “I think that as an agricultural crop, cannabis in Washington will be second only to apples,” says Kennedy of Privateer Holdings. He spent two months crunching the numbers “about 20 diff erent ways,” he says, and his business partners are confident their gamble will bear fruit.